Task: Generate a report for All Installed/Activated Features for the entire SharePoint Environment. Here are some nifty PowerShell scripts to find features installed on the farm as well as specific features activated on a particular scope. Lets find and list where a feature is activated. Tip: To find out all SharePoint enterprise feature usage, use: PremiumWebApplication, PremiumSite, PremiumWeb accordingly on Feature Display Names. "$($FeatureDisplayName) Installed at Farm Level!" Write-Host "Processing web Application : $($WebApp.url)"
"$($FeatureDisplayName) Activated at Web Application $($webApp.URL)"
"$($FeatureDisplayName) Activated at Site Collection $($Site.URL)"
"$($FeatureDisplayName) Activated at Web Level $($web.URL)"
How do I find all custom features? 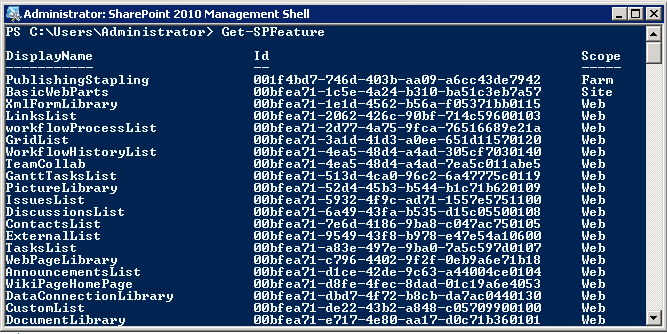 We can run Get-SPFeature on a fresh sharepoint machine, take that inventory in a csv file. Run it again in your targt machine which has custom features and compare! | ft -property displayname,scope -auto -groupBy solutionid > "d:\features.txt"
How to Delete a SharePoint List using PowerShell?